Looking for law-enforcement-grade .223? 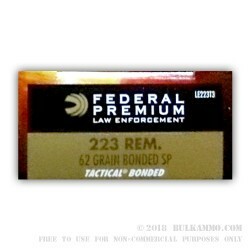 Federal’s Tactical .223 ammunition features 62-grain bonded soft point projectile loaded in boxer-primed, noncorrosive, reloadable nickel-plated brass cases. These rounds produce a muzzle velocity of 3050 FPS and are the ammunition used by some law enforcement agencies. The projectiles in these rounds feature a lead core with a bonded copper jacket. This ensures the core and jacket will not separate from one another and makes for better barrier penetration. The soft point projectile enables decent expansion after impact, for terminal result in defense or hunting situations and are a great option for varmint hunting or for home and self-defense. Each box of Federal .223 Tactical comes with 20 rounds, and these rounds are only made available to the public via police trade-ins. Based in Anoka, Minnesota, Federal Ammunition for nearly 100 years, has produced some of the world’s most reliable and accurate ammunition. Whether you’re a target shooter, hunter or just looking for a good self-defense round, Federal Ammunition is a name trusted by shooters everywhere.